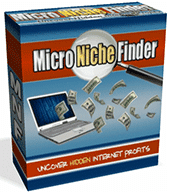 Micro Niche Finder is a piece of software that aims to show people how to easily rise to the top of the Google search engine rankings by employing a number of different methods, the main one being helping you to find profitable niche markets to target that have previously gone unnoticed. This niche finder software provides you with six ways to help you earn money through the niches that you find. These are; how to promote your niches through one page articles, how to set up set-and-forget adsense pages, how to create niche private label rights packages, building web 2.0 properties, making use eBay and also Yahoo Answers. The software, which is installed so it runs from your desktop, is currently in its 5th release. 0 Response to "GET Micro Niche Finder"